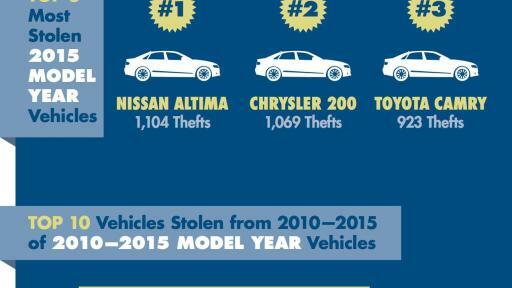 The National Insurance Crime Bureau (NICB) today released its annual Hot Wheels report which identifies the 10 most stolen vehicles in the United States. The report examines vehicle theft data submitted by law enforcement to the National Crime Information Center (NCIC) and determines the vehicle make, model and model year most reported stolen in 2015. See the national report here. Download the 50-state report here. See the video here and an infographic here. About the National Insurance Crime Bureau:Headquartered in Des Plaines, Ill., the NICB is the nation’s leading not-for-profit organization exclusively dedicated to preventing, detecting and defeating insurance fraud and vehicle theft through data analytics, investigations, training, legislative advocacy and public awareness. The NICB is supported by more than 1,100 property and casualty insurance companies and self-insured organizations. NICB member companies wrote over $413 billion in insurance premiums in 2015, or more than 79 percent of the nation’s property/casualty insurance. That includes more than 94 percent ($187 billion) of the nation’s personal auto insurance. To learn more visit www.nicb.org.